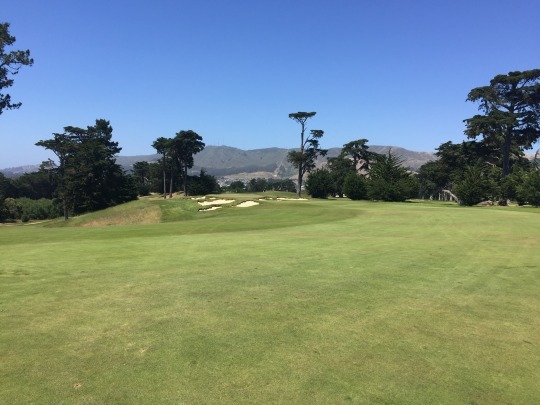 Well, I’ve danced around this round, but my visit to California Golf Club of San Francisco was the centerpiece of my Bay Area trip last week. In fact, it was kind of right in the middle of the trip, which is why I didn’t want the review to get lost in the shuffle. 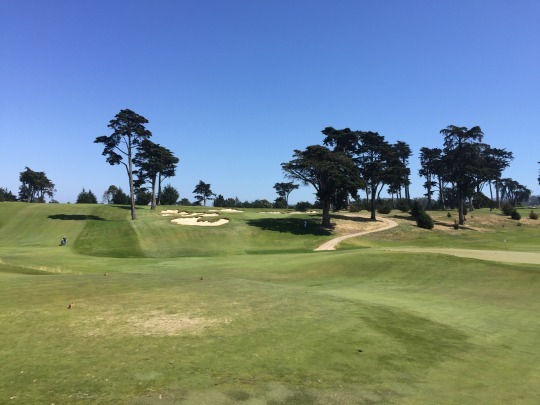 This is a special course that deserves its own feature article. 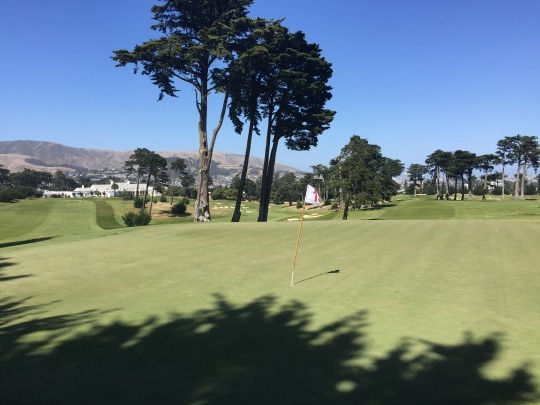 Cal Club stands out a bit in San Francisco because it’s one of the top private clubs, but it is not in the city’s giant golf cluster where Olympic Club, San Francisco Golf Club, TPC Harding Park and Lake Merced all sit. 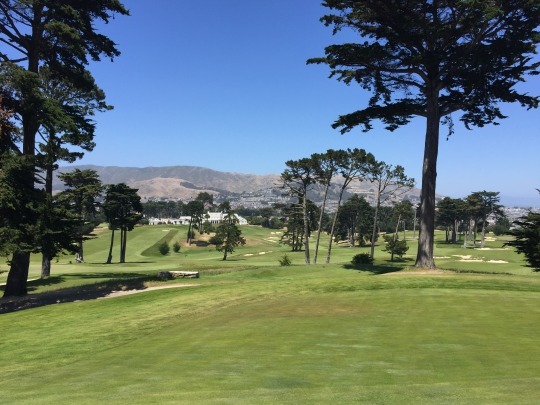 Cal Club is located in South San Francisco and that helps give it some distinction with some different scenery. 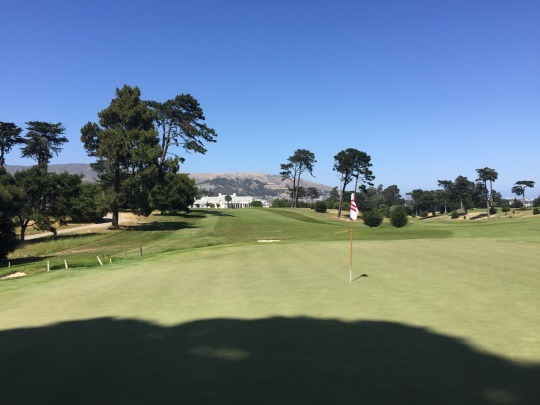 There are a few elevated points on the course where you can see the south end of town, a bit of the bay and, of course, the big hillside that reads “South San Francisco – The Industrial City.” You will see some planes overhead from the airport, which is also not too far away. 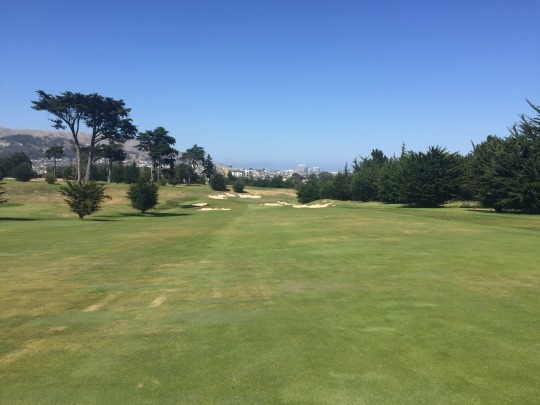 Being in San Francisco, you can be sure that Cal Club is a very hilly course. I’d say there are only a couple holes out there where some change in elevation isn’t a factor. It can also get windy here, especially in the afternoon. It was very windy when we played the back nine. 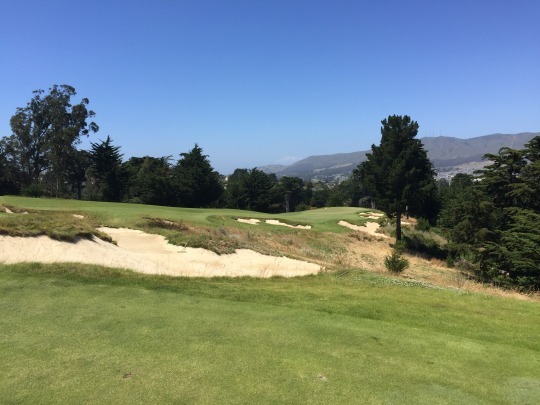 Oddly enough, most uphill holes were into the wind while the downhill ones were with the wind. We were playing the middle tees. 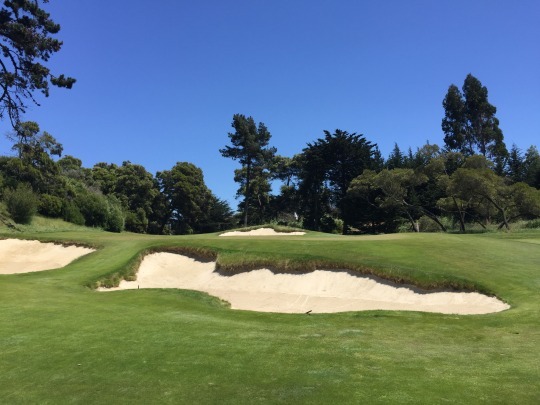 I would argue that the par-5 15th (only 474 yards) was playing more like a legit par-6 than the one over at Lake Chabot the day before. 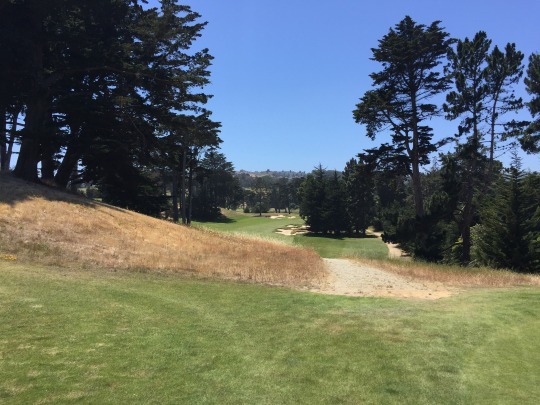 I hit a good driver/3-wood/3-wood up the hill and into the wind, and was still well short of the green. Meanwhile, on the 433-yard par-4 14th hole (downhill/downwind), I hit driver/hybrid over the green. I received an invite to play the course, and I was able to bring along a friend of mine. It was a bucket list experience for both of us. 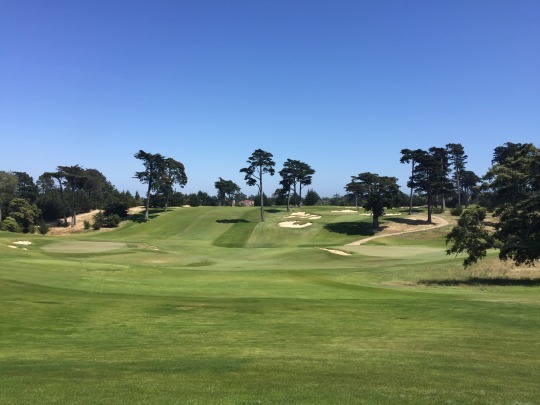 Cal Club is ranked in most American Top 100 lists and in the top 10 or 20 of several California lists I looked at. It’s not an easy private club to get on, and I was very grateful for the opportunity. We ended up playing as a twosome, teeing off just after 1:00. We were aided by our caddie, Steve, who did a great job for us. 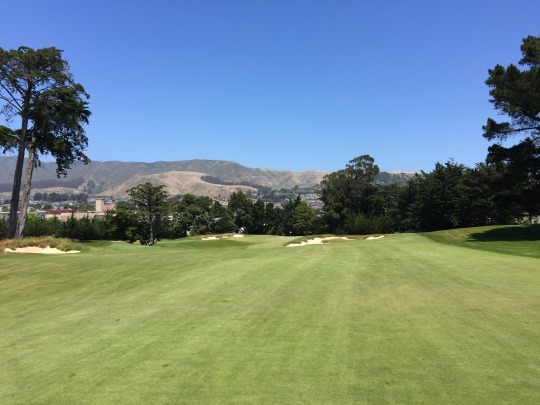 One of the unique design features at Cal Club is that there are a lot of interconnecting/overlapping fairways, especially on the back nine. 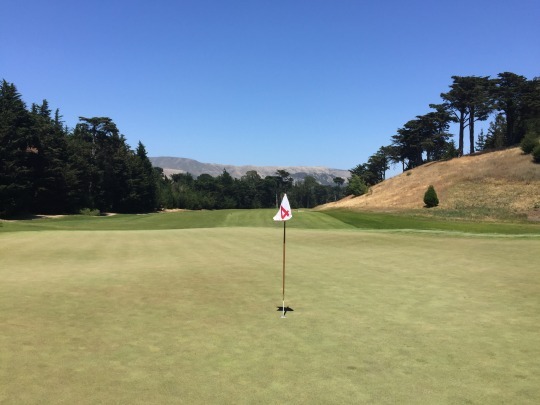 You can imagine some members might make up their own holes when the course is empty, or they can do special “cross country” tournaments to mix up the routing from the normal layout. 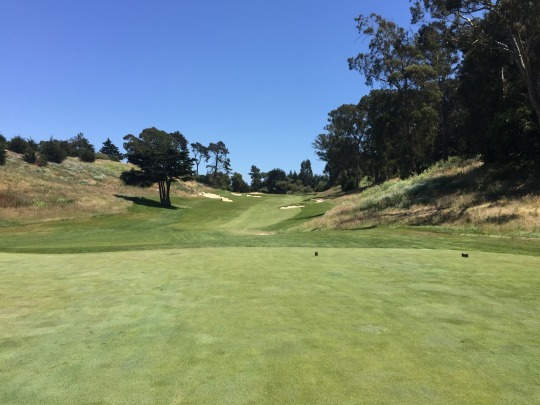 A great example of this is the par-3 16th hole, which is a nice downhill shot to the green. 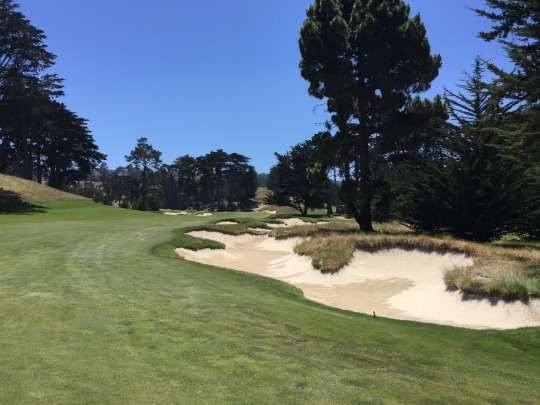 As a par-3, it’s intimidating with deep bunkers guarding the front and back. However, when you get up above the green and look back, you see the 17th fairway rolling right up to the edge of the 16th green from the side. 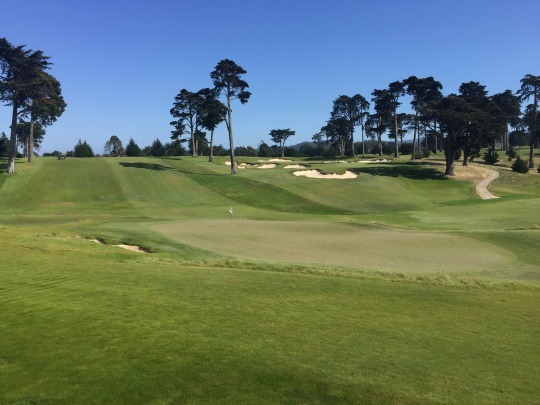 It easily looks like that could be played as par-4 or par-5 coming in from that direction. Right below the clubhouse sits a very open area that is home to the 10th tee, 11th green, 12th tee and 18th green. It has a unique feel and presentation. I mentioned MacKenzie’s involvement with the bunker designs, and you can definitely see his influence here. The bunkering is outstanding. 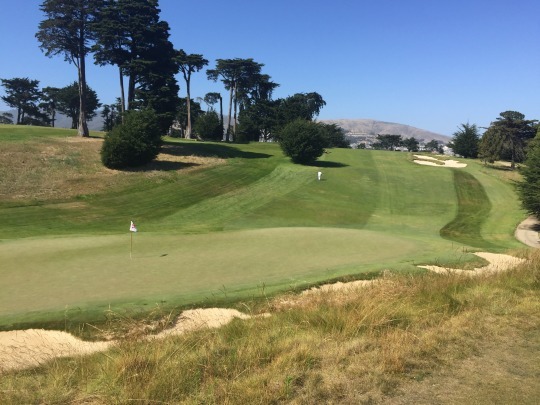 Every green is very well-guarded by deep, jagged and intimidating bunkers lined with deep fescue rough. My friend and I both found our fair share. It didn’t help the scores, but it was a vital part of the experience. 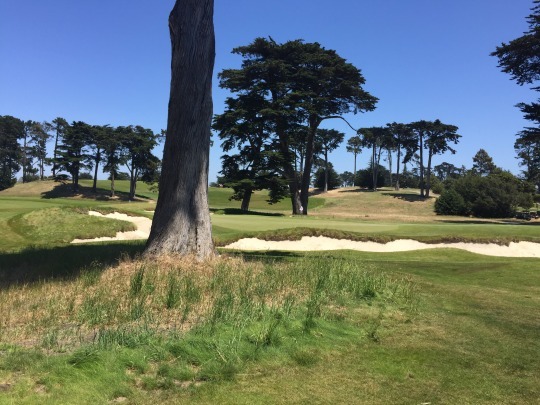 There are many very memorable holes at Cal Club. 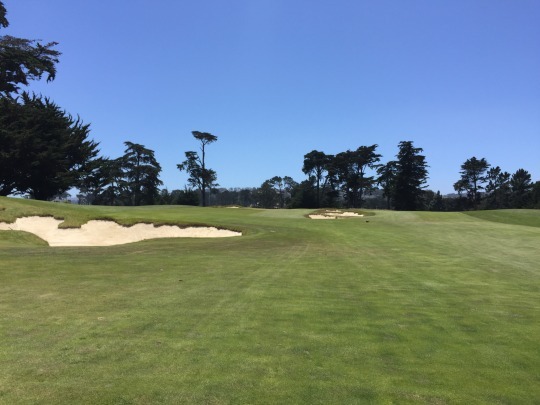 However, none stands out to me more than the par-4 7th, which I believe is a new hole that was added during the last renovation. This is definitely the most dramatic hole on the course. It is a severe dogleg right playing over a little canyon. 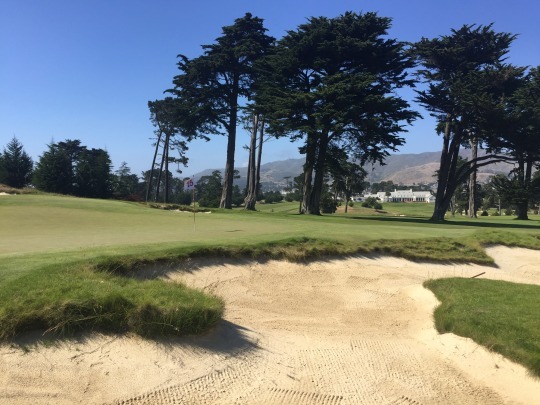 Huge bunkers line the right edge of the fairway at the corner, and then everything slopes down toward the green once you get past the corner. From the furthest-back Venturi tees, it is 411 yards. Then, it is 395 yards from the back tees. Only the longest of hitters may try to cut the corner from back here. 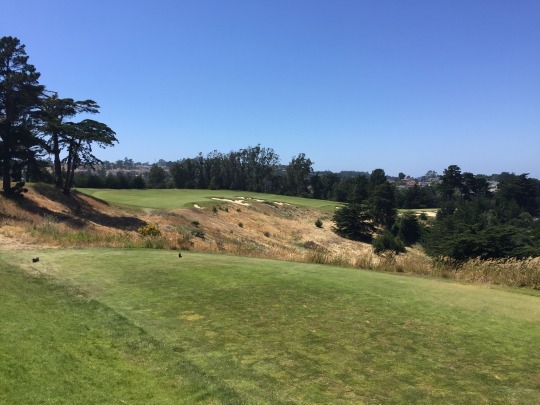 However, we were playing the middle tees, making this hole a much-more-tempting 306 yards. 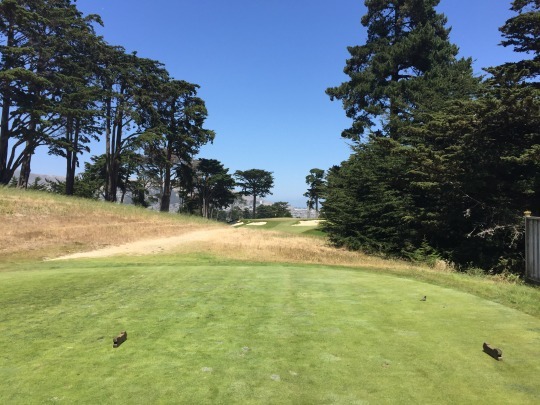 My caddie showed me the ideal line over the corner, but I didn’t have quite enough confidence and aimed about 10 yards left of where he told me. I hit the exact shot I wanted. It cleared the corner, but not in the ideal spot. It ended up rolling into a bunker about 60 yards short of the green. He said if I had hit the same shot on the line he told me, I probably would have been on the green. That just goes to show you that you should usually trust your caddie! 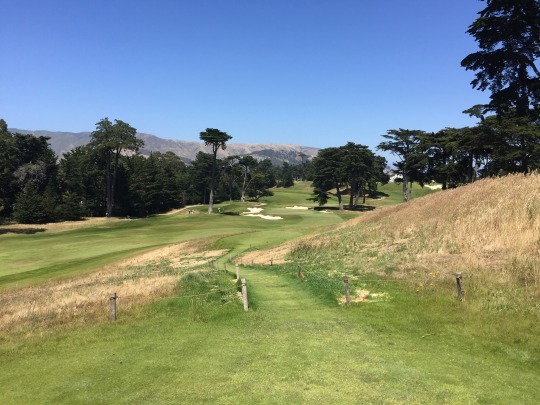 No matter what, it is a stellar hole design that is equally fun and intimidating if you play the proper tees. Though there are trees throughout the course, they are not as dense as most courses around here. 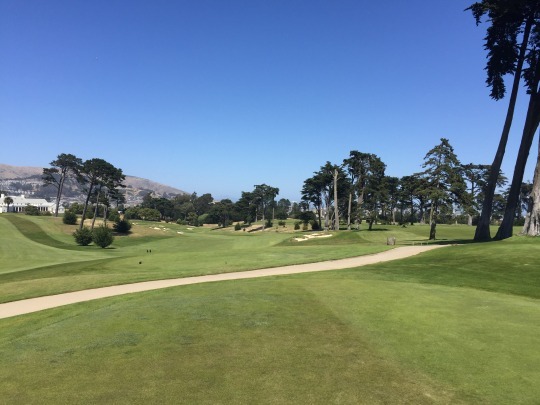 Cal Club never feels tight and you can usually feel comfortable ripping a driver on most holes. Also, the turf conditions are meant to be very firm and fast. 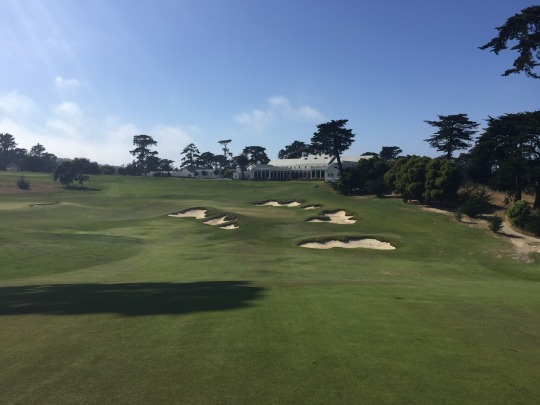 Cal Club is a distinct contrast to something like Harding Park, where things are lush, green and soft. 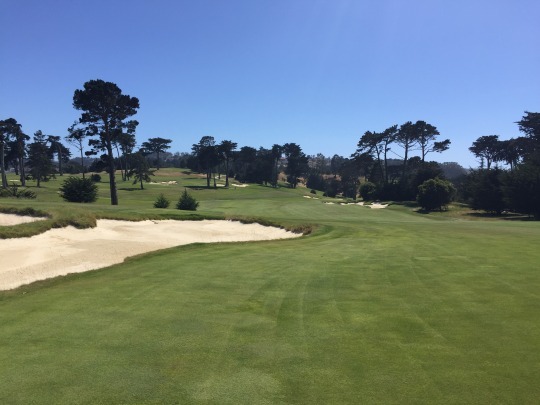 Cal Club has fescue fairways and pure bentgrass greens. The appearance is a lighter green in color (it actually looks greener in pictures than in person, which is not usually the case), but it plays nicely. You get lots of roll-out on drives. The fairway lies are tight, but still have a good enough pad underneath to hit any type of shot you want. 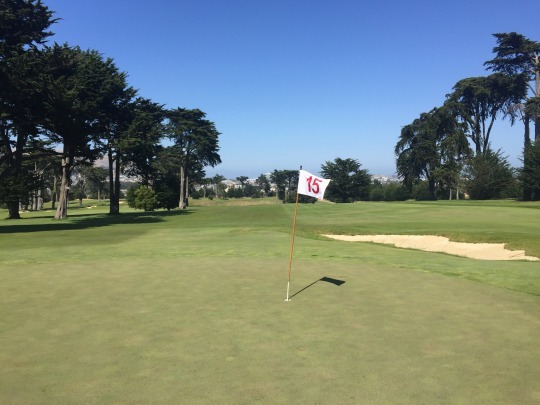 The greens are very firm and super fast, so you usually have to play to the front and let it roll out. Players that can generate a lot spin might be able to get the ball to stop somewhat quickly, though. 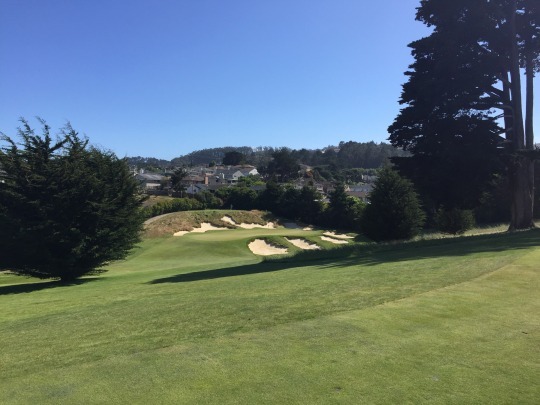 This course is really set up for a pro-level of play, maybe more than any other course I’ve played. I felt like I got the firm/fast conditions they wanted for the U.S. Open at Erin Hills, until the rain softened their course up too much. Basically, the conditions were excellent all the way around, so there isn’t much else to say about how great the course was. 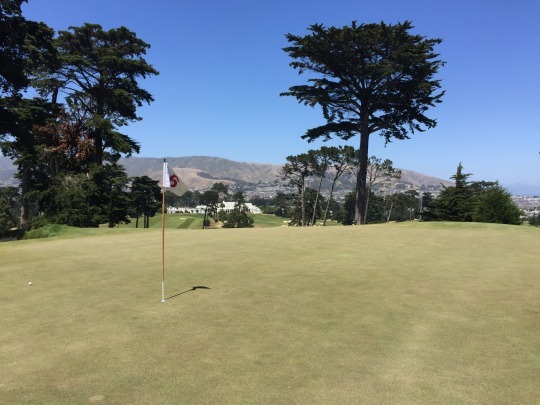 Once you are in the door as a guest, Cal Club has a very relaxed and friendly atmosphere. We were treated well, but the feeling was more casual. It’s mainly about the golf here, and that’s how I like it. 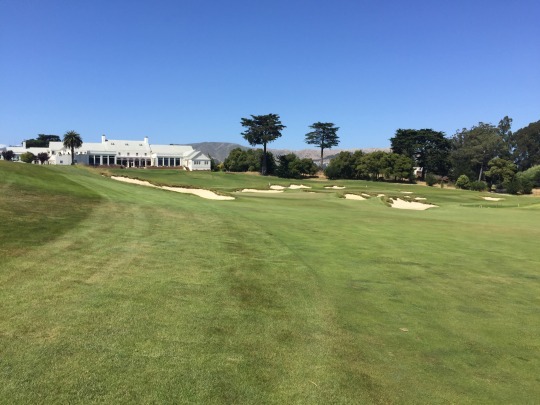 Cal Club was truly a wonderful golf experience that I won’t soon forget. 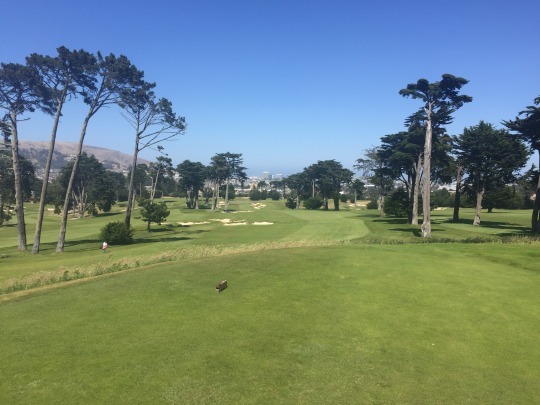 It’s easy to see why this is considered one of the best courses in the state (and country for that matter). If you ever get a chance to play here, take advantage of it! The 7th hole below. This is the tee view and you can barely see the green way down on the right between the trees. Then, from behind the green you see the connected 17th fairway and it looks like a totally different hole that could be played in from that direction.